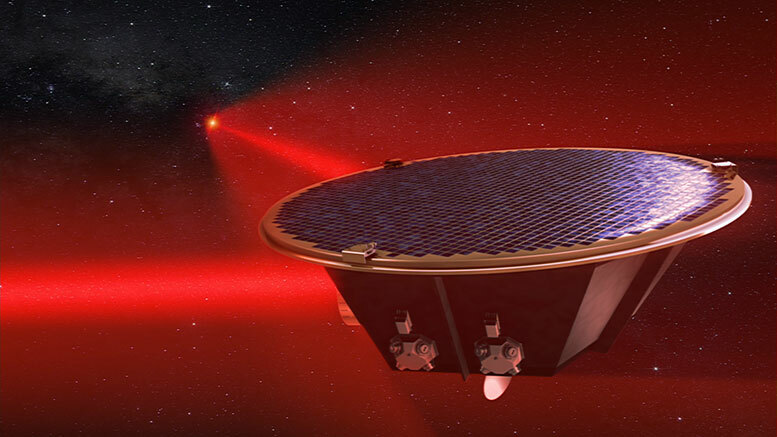 The European Space Agency (ESA) has selected the Laser Interferometer Space Antenna (LISA) for its third large-class mission in the agency’s Cosmic Vision science program. The three-spacecraft constellation is designed to study gravitational waves in space and is a concept long studied by both ESA and NASA. In September 2015, these waves were first directly detected by the National Science Foundation’s ground-based Laser Interferometer Gravitational-Wave Observatory (LIGO). The signal arose from the merger of two stellar-mass black holes located some 1.3 billion light-years away. Similar signals from other black hole mergers have since been detected. For instance, the GRACE Follow-On mission, a U.S. and German collaboration to replace the aging GRACE satellites scheduled for launch late this year, will carry a laser measuring system that inherits some of the technologies originally developed for LISA. The mission’s Laser Ranging Interferometer will track distance changes between the two satellites with unprecedented precision, providing the first demonstration of the technology in space. In 2016, ESA’s LISA Pathfinder successfully demonstrated key technologies needed to build LISA. Each of LISA’s three spacecraft must gently fly around its test masses without disturbing them, a process called drag-free flight. In its first two months of operations, LISA Pathfinder demonstrated this process with a precision some five times better than its mission requirements and later reached the sensitivity needed for the full multi-spacecraft observatory. U.S. researchers collaborated on aspects of LISA Pathfinder for years, and the mission carries a NASA-supplied experiment called the ST7 Disturbance Reduction System, which is managed by NASA’s Jet Propulsion Laboratory in Pasadena, California. Be the first to comment on "European Space Agency to Develop Gravitational Wave Space Mission"